Cast: Miles Teller (Andrew Neiman), J.K. Simmons (Terence Fletcher), Paul Reiser (Jim), Melissa Benoist (Nicole), Austin Stowell (Ryan Cooper). Whiplash is a terrific psychological drama about the tense professional relationship between two men. 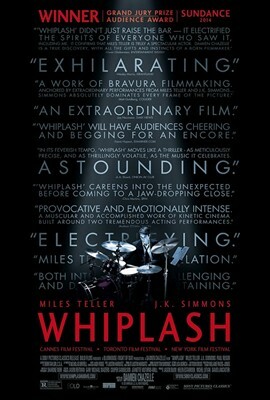 Andrew Neiman (Miles Teller) is a young drummer enroled at the Shaffer Conservatory of Music, where he catches the attention of jazz conductor Terence Fletcher (J.K. Simmons). Andrew wants to become one of the greats whereas Fletcher is driving his players to become great. But the pressure that Fletcher applies to his musicians goes beyond merely having high expectations and tips over into outright bullying. However, his contention is that the only musicians who truly become great are those who care enough to transcend anything that life can throw at them. Fletcher continually plays mind games with his musicians. No sooner does Andrew get elevated to the role of core drummer in Fletcher’s jazz orchestra than it is cruelly snatched away again. We also see various other musicians being subjected to degrading treatment for failing to meet Fletcher’s impossible-to-meet expectations, but it is always clear that Andrew has the greatest drive to fight for a place in Fletcher’s band and to achieve greatness. However, Andrew’s own determination leads to a disaster that threatens both his career and Fletcher’s. It is hard to think of another film that has given such a visceral depiction of a musician’s striving to be the best there is. This is literally a struggle involving blood, sweat and tears. Miles Teller is splendid as Andrew, but the greatest plaudits must go to J.K. Simmons for his terrifying portrayal of Fletcher (he has been nominated for an Oscar, but quite why he falls into the “Supporting Actor” category I don’t know).